In our Gospel today, Christ heals the man born blind. Jesus tells His disciples that this man’s disability is not because of his or his parent’s sinfulness but rather to be able to show the goodness of God in Jesus’ healing of him. Oh, how we are always ready to accuse or blame or find fault with others. A perfect example is a missing can of expensive paint that I bought to complete a project. We told a painter where to find it and then were told it could not be found. Immediately our thoughts went to, “Who could have taken it and why.” After coming to no conclusion, I went to the store to buy another can and upon finding it on the shelf I realized I had been thinking about a completely different paint. I had never bought previously. So, all our suspicions boiled down to a faulty memory. The point of this story, in relation to our Scripture, is that we all are often willing to quickly follow the path of accusing someone else of sin. Today, at each mass, Fr. Bob and Friar Ed will be giving the sacrament of the sick to those who approach the altar. Many will approach and ask for a physical healing, but we also need a spiritual healing. Fr. 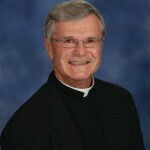 Bob often speaks in his homilies about seeking a closer relationship with Jesus. It is in that closer relationship that we find the ability to forgive others and not seek to accuse or become angry. Sometimes the hurt within us yields anger or unhappiness towards others. It is then that the healing can take place. We must pray for the Grace to overcome our personal pain and treat others in a Christ-like way. By seeking and accepting a closer relationship with God we become more Christ-like.